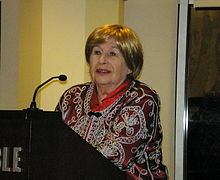 Marion Gibbons (née Chesney; born 1936) is a Scottish writer of romance and mystery novels since 1979. She has written numerous successful historical romance novels under a form of her maiden name, Marion Chesney, including the Travelling Matchmaker and Daughters of Mannerling series. Using the pseudonym M. C. Beaton, she has also written many popular mystery novels, most notably the Agatha Raisin and Hamish Macbeth mystery series. Both of these book series have been adapted for TV. She has also written romance novels under the pseudonyms Ann Fairfax, Jennie Tremaine, Helen Crampton, Charlotte Ward, and Sarah Chester. Writing as Marion Chesney, her most recent endeavour is an Edwardian mystery series featuring Lady Rose Summer, a charming debutante with an independent streak, and Captain Harry Cathcart, an impoverished aristocrat. In a recent interview, she stated that she has ceased writing the Edwardian series due to the pressure of writing for the Agatha Raisin and Hamish Macbeth series. Marion Chesney was born in 1936 in Glasgow, Scotland, and has worked as a buyer of fiction for a Glasgow bookshop, theatre critic, newspaper reporter and editor. She married Middle East Correspondent Harry Scott Gibbons; they had a son Charles. She had lived in the USA. She divides her time between a cottage in the Cotswolds and Paris. There are also the short stories Agatha Raisin and the Christmas Crumble (2012), Hell's Bells (2013) and Agatha's First Case (2015), as well as The Agatha Raisin Companion (2010) with introduction by M.C.Beaton. This page was last edited on 5 March 2019, at 04:32 (UTC).